From Labourer to Master Mason – Gangaben Vaniya is a master mason in Ahmedabad, India. With support and training from SEWA’s Mahila Housing Trust (MHT), Gangaben increased her skills and income in a profession where women are often paid less than men. Now an independent contractor, she employs other women. Organizing the Patience Industry by Ruth Castel-Branco (WIEGO Workers' Lives publication) – Camarada Albertina Mundlovo has been a domestic worker in Maputo, Mozambique since the 1990s. She is a member of the National Union of Domestic Workers (SINED), which is advocating for Mozambique to ratify the ILO's Convention 189 on Decent Work for Domestic Workers. Profile: Marcelina Bautista by Steffany Sinclaire – During her career as a domestic worker, which began at 14, Marcelina experienced the difficulties these workers face and became an advocate for change. Profile: Myrtle Witboii by Leslie Tuttle – Myrtle Witboii has been advocating for the rights of domestic workers since 1969, helping to create both the South African Domestic Workers Union (SADWU) and the South African Domestic, Service and Allied Workers Union (SADSAWU). She was the first president of the International Domestic Workers Federation (IDWF). Small World, Big Goals: A Home-Based Garment Worker in Delhi (WIEGO Workers' Lives publication) – From her Delhi home, Farida-ben embroiders garments for foreign retailers. Denied an education and other options, she has done this work since she was a girl. Today, her membership in the Self-Employed Women’s Association (SEWA) and her involvement with an ethical, SEWA-based producer company have expanded her world – and given her insight into the inequity of the global value chain. Home-Based Garment Workers – The Impact of the Self-Employed Women’s Association (SEWA) – As one of the most globalized sectors, the garment sector employs a significant number of workers—many of whom are women. Ayesha-ben’s Story illustrates how India’s Self-Employed Women’s Association aids garment workers in times of need, and helps them to negotiate fairer wages, better working conditions and higher piece-rates. Headstrong: Profile of a Headloader in Ahmedabad, India by Leslie Vryenhoek (WIEGO Workers' Lives publication) – Shanta Bababahi Bhalerao works as a headloader in Ahmedabad, India. Through SEWA, Shantaben received education and training in financial planning and legal issues that have improved her ability to cope with the difficulties of her life. Sewing a Better Future: Sarita, Home-Based Worker, Nepal - Sewing for the Women Skill Development Organization in Nepal, a partner in WIEGO's Organizing Women for Fair Trade project, turned Sarita's life around. Profile of a Home-Based Shoemaker in Thailand -- Auntie Ngarm is one of the millions of homeworkers in Thailand who work long hours for low wages, have no employment contracts and are sometimes swindled out of their payments. WIEGO has partnered closely with HomeNet Thailand to help these workers access their rights under the Homeworkers Protection Act. Membership Means More Success for Chop Bar Operator – Naana Adede is an indigenous caterer in Accra, Ghana. She talks about the issues she faces, and how belonging to a workers' organization has made a big difference in her work life. WIEGO has done research in Ghana on occupational health and safety issues relating to this group of workers. Gaining Ground: The Cooperative Life of a Smallholder in Uganda by Leslie Vryenhoek, (WIEGO Workers' Lives publication) - With lives and livelihoods governed by so many forces beyond their control, women coffee producers like Jenipher Wettaka know it takes more than a global movement to make lives and livelihoods better. It takes a cooperative spirit in their communities to cultivate change. Location, Location, Location: The Life of a Refugee Street Barber in Durban, South Africa by Françoise Carré (WIEGO Workers' Lives publication) - Choma Choma Nalushaka is a Congolese refugee living in South Africa. He established himself as a street barber in his new home in Durban, but faces many challenges in his new work. Urban Renewal, Heritage Sites & Urban Livelihoods: Devi-Ben, Street Vendor by Marty Chen - Devi-Ben sells picture frames and clocks in Ahmedabad. Last year, she and fellow vendors were evicted from their traditional market when the city moved to "beautify" the historic area. "But we are part of the heritage...of the city," Devi-Ben told WIEGO's Marty Chen during an Exposure-Dialogue Programme. Elba Rojas, Street Vendor in Lima, Peru – Elba has made her living selling chilis in La Parada wholesale market for years – but everything changed after the decision to move the market led to a violent clash in 2012. Force of Nature: Shantaben, Vegetable Vendor and Defender of Workers' Rights by Leslie Vryenhoek – Shantaben is a vegetable vendor in in Ahmedabad, India and has been a member of SEWA, a WIEGO member and partner, for more than three decades. SEWA has provided Shantaben and her family with education in financial planning, occupational health and safety, as well as legal training. The Journey of Varshaben: From Vegetable Vending to Video SEWA – Varsha Prabhudas Parmar is a vegetable vendor in Chandkheda, India. She joined SEWA Academy’s Skill Development Programme for young women to learn English and computer skills, and also attended several classes through the Academy’s Life Skill Training Programme. She now works at Video SEWA in addition to vegetable vending. – For Ashaben the struggle in life began very early, soon after she was married, when her husband was unemployed for a few months. God is My Alarm Clock: A Brazilian Waste Picker's Story by Deia de Brito (WIEGO Workers' Lives publication) – Dona Maria, a force in organizing waste pickers in Belo Horizonte, Brazil, wakes at 5 a.m. each morning to attend her 7 a.m. shift. Bogota Recycler Nohra Padilla Praised on World Stage - Nohra Padilla was waste picking on a dump in Colombia by the time she was seven years old. On April 15, 2013, her activism on behalf of recyclers was recognized with the world’s largest prize for grassroots environmentalists. Women Behind the Wheel: The Story of Satvashila Potekar – Satvashila is one of six women truck drivers for SWaCH, a waste pickers' cooperative in India. She's collects waste and transports it to the Moshi landfill. – If there is one thing that Mangal knows with certainty, it is that her earnings from waste and scrap are what support her family. 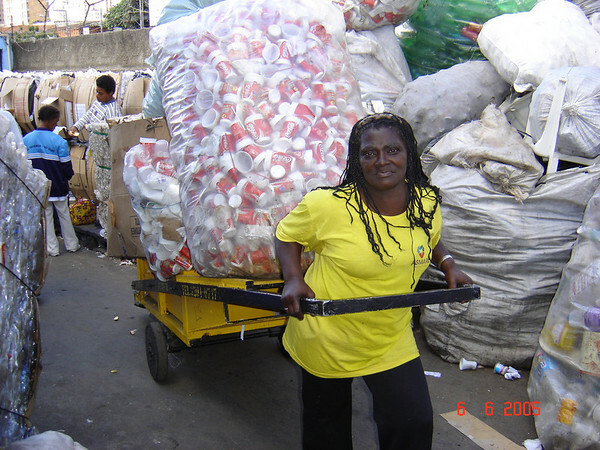 The Global Alliance of Wastepickers offers a gallery of waste pickers from around the world. See the gallery. WIEGO and its partners in the Inclusive Cities project studied the impact of the global economic crisis on urban informal workers. To learn more, visit Links with Economic Crises. Trying New Things, Josue Ramos, Street Vendor, Lima, Peru – The global economic crisis intensified competition and persecution from municipal security services too, as more traders turned to the streets. Longer Hours for Less, Sabina Carlos, Market Vendor, Lima, Peru – As a result of the 2008 economic crisis, Sabina, a market vendor in Peru, changed from working nine hours per day to 12 per day, yet her income was still affected as her competition increased. "Last year I was making up to 20 soles per day (approximately US$6.5). Nowadays, I am only making 10 soles." Always on the Fringe, Chaya Manik Sontakke, Waste Picker in Pune, India – The global economic crisis dropped both the availability and the price of recyclable materials, affecting waste workers like Chaya. "What did this recession mean to me? Well the quantity of scrap available at Infosys decreased dramatically. ... So now the quantity of scrap has halved as have our earnings and our work time has also reduced by a couple of hours." The Face of Closing Factories and Financial Crisis by Madhuben Bhagwandas Parmar – "How can I pay rent, when there is no money to spend on food?" Financial Crisis and Difficult Times: My Story by Manjulaben Laxmanbhai Parmar – "Soon after the closure of the factory, my elder daughter gave birth to a child. I was unable to afford the expenses providing proper and nourishing diet to my grandchild." Tough Times for Construction Workers by Samuben Bhanjibhai Makwana - The impact of the global economic crisis has taken a toll on construction workers in India. While some previously earned wages of Rs150 per day before the crisis, many now struggle to find work and to meet the financial needs of their families. Diminished Earnings after Crisis - Orlando López, Rug Maker, Oaxaca Mexico – "When the crisis started my earnings were reduced up to 40 per cent, but with the influenza (H1N1) scare they were lowered by ... up to a 90 per cent." Informal Workers in Oaxaca, Mexico – The impact of the recession and the H1N1 flu on three families of craftspeople is detailed in these accounts from 2009-2010. "We have not sold enough products. There is no comparison to past years. This year, sales are very low, tourism dropped tremendously."